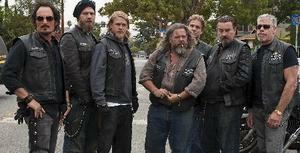 Overview - The misadventures of SAMCRO continues revving up in the town of Charming in this third season. Don't miss our reviews for 'Sons of Anarchy: Season One' and 'Sons of Anarchy: Season Two,' and please be advised this review may contain spoilers from those seasons. For two seasons, the Sons of Anarchy Motorcycle Club Redwood Originals (SAMCRO) led by club president Clay Morrow (Ron Perlman) and his stepson/VP Jackson "Jax" Teller (Charlie Hunnam) have been the watchful protectors of Charming, California. The band of outlaws have taken any means necessary to keep drug trafficking scum and greedy corporate developers from moving in on their turf and tarnishing their hometown -- all the while staying one step ahead of the law. Now FX's highest-rated series to date is back and bathed in even more guts, glory, and gun oil than ever. 'Sons of Anarchy: Season Three' finds a family torn and the future of a brotherhood left hanging in the balance. Club matriarch Gemma (Katey Sagal) has been forced to go on the lam after being framed for murder by the black-hearted Agent Stahl (Ally Walker). She's also unaware that her grandson Abel is missing, kidnapped by the same man who killed Half-Sack (Johnny Lewis) out of misplaced retaliation for the death of his own son. But back on the home front, Jax prepares to embark on a relentless quest to find his baby and the prospect's killer with Clay and the rest of the club behind him. Except with few leads and serious weapons charges still looming over their heads, this time the MC is going to need some help -- and the luck of the Irish. The third season of 'Sons of Anarchy' is somewhat of a departure from the first two seasons, but that doesn't make it any less entertaining. Series creator Kurt Sutter didn't want the show to start becoming stagnant and repetitive by this point, so he decided to take a risk and mix things up a bit by removing SAMCRO from their element -- out of the town they'd kill for to protect -- sending them to Belfast for a good number of episodes where we meet many new faces associated with their North Ireland chapter (SAMBEL). Not only that, between Abel's disappearance and Gemma's wanted status, the 'Hamlet'-esque elements are also put on hold as Jax has to bury the hatchet with Clay (at least for a while) in order to focus on finding his son. But Sutter and his team of writers wisely don't deviate too far from their proven formula, and continue to weave in unexpected twists and turns and even expose a few deep, dark secrets along the way -- firmly grounding 'Sons' as an intensely exhilarating crime drama of Shakespearean proportions, and one that keeps its viewers salivating for more. But as said in previous reviews, what makes 'Sons of Anarchy' such a compelling watch is the amazing ensemble cast embodying these diverse and fascinating characters. While absolutely everyone pulls their weight in the show, the highlights this season are Maggie Siff as Jax's doctor girlfriend Tara, who finally passes the point of no return and undergoes her metamorphosis from an outsider to a full-fledged "old lady." Walker also shines as a conniving, sociopathic antagonist, dethroning Adam Arkin's portrayal of Ethan Zoebelle as the number one villain everyone loves to hate. It's Sagal (in her well-deserved Golden Globe-winning role) and guest star Hal Holbrook as Gemma's dementia-ridden father, though, who mesmerize the most. Holbrook particularly has some truly heart-wrenching moments, and the time the two of them spend together shows us a tender, vulnerable side to Gemma that we really haven't seen before. 'Sons of Anarchy' is much more than just a show about a badass brotherhood of bikers. It's also a study of loyalty, friendship, and family. The gritty action, the slick scripting, and the superb ensemble cast fuse together perfectly producing one of the most enjoyable shows on cable today. Similar to previous seasons, 'Sons of Anarchy: Season Three' rides onto three BD-50 Blu-ray discs inside a standard blue flipper case. There are a few annoying forced pre-menu trailers which can be skipped using the remote. Although the packaging lists the set as being Region A, the discs themselves are reported to be region-free and therefore should play in any player. Note that since this set comes from Fox who is notorious for glitchy playback issues on new releases, a firmware update may be required for some players. The discs wouldn't play at all on my Blu-ray compatible notebook PC, and my main home theater machine couldn't play the BD-Live content, either. Alas, the studio continues to blatantly waste paper by tacking on an embossed cardboard copy of the cover art on the front of the shrinkwrap which serves no other purpose than to display a couple of small promotional stickers. A slipcover I could understand as a lot of people actually collect those, but this slip "face" is completely useless. Next time Fox, please just stick any stickers directly on the packaging or spend a few extra cents to make a true slip that doesn't go directly into the trash. As with the previous seasons, 'Sons of Anarchy: Season Three' was shot in high-definition and the 1080p/AVC MPEG-4 (1.78:1 aspect ratio) transfer of the Blu-ray is a grand spectacle in high-def. The clarity of the image once again offers a razor-sharp, window-peering experience. There's an extremely strong sense of depth and colors are just as bold and beautiful as before. Contrast is solid and slightly elevated, which makes whites run a bit hot for stylistic purposes, but black levels remain deep and inky. Fine detailing is amazing, too. Fabric and leather textures pop off the screen, and the pores, wrinkles, scars, stubble, and tattoos on flesh is always incredibly lifelike. The rough, weathered faces of the cast are virtual road maps of lives with countless stories to tell. The third season does have some of the same issues from the first two releases, but to be honest they're relatively minor. A small amount of crushing still occurs occasionally in darker scenes, and sometimes there's the odd halo or appearance of slight edge enhancement. The compression noise that plagued the first season is no longer much of a problem, however, and only becomes noticeable during one specific scene with Jimmy O. in the twelfth episode, "June Wedding." 'Sons of Anarchy: Season Three' comes armed and dangerous with a terrific lossless DTS-HD Master Audio 5.1 mix to match those from the first two seasons. Dialogue is clean and evenly balanced throughout all thirteen episodes presented here. Even the hushed whispers between characters who are up to no good and plotting something behind others' backs are always represented at appropriate volumes. The mix has a solid amount of ambience in the surrounds, and when gunfire erupts (which is frequently) bullets blaze through the entire soundstage. The LFE has a strong presence, too. Sutter seems to be a fan of music montages so the audio mix is filled with catchy hard-driving rock tunes lined with deep, pulse-pounding bass. The roar of Harleys also encircle the listening area quite often and can be felt through the floor. Plus there are a few room-shaking explosions that will send most small pets in your household running for cover. 'Sons of Anarchy' fans can definitely looks forward to another awesome-sounding season on Blu-ray. The discs also include optional English SDH, French, Spanish, Portuguese, Mandarin (Simplified) subtitles. 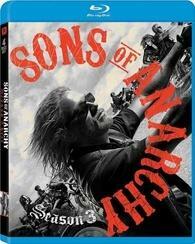 The Blu-ray edition of 'Sons of Anarchy: Season Three' includes all of the supplements found on its DVD counterpart. However, most of the content found in this set is presented in HD. Audio Commentaries – As with previous seasons, three of the episodes for this third season are equipped with an optional commentary track featuring series creator/writer/producer Kurt Sutter joined by various cast or crew members. The two involving the actors are more of a party, while the writers' track is the most technical of the three. All of them are pretty engaging and filled with camaraderie, especially the celebratory season finale send-off. 'SO' (Disc 1) – The season premiere includes a track featuring Kurt Sutter, writer/co-executive producer Dave Erickson, writer/co-producer Chris Collins, writer/co-producer Regina Corrado, writer/co-producer Liz Sagal, and writer Marco Ramirez. 'Firinne' (Disc 2) – The second track is for the tenth episode of this season with Sutter and stars Charlie "Jax" Hunnam, Katey "Gemma" Sagal, Maggie "Tara" Siff, and Tommy "Chibs" Flanagan. 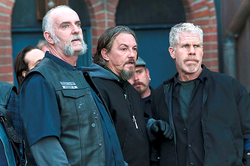 'NS' (Disc 3) – The last commentary is for the season finale with Sutter and stars Charlie Hunnam, Ron "Clay" Perlman, Mark "Robert Munson" Boone Jr., Kim "Tig" Coates, Tommy "Chibs" Flanagan, Theo "Juice" Rossi, Ryan "Opie" Hurst, and Dayton "Chief Wayne Unser" Callie. Extended Episodes – The episodes "SO," "June Wedding," and "NS" are presented in unrated extended form here. Writer's Roundtable (1080p, 18 minutes, Disc 3) – Kurt Sutter is joined by his team of writers at a steakhouse in Burbank to answer about a dozen questions or so sent in by fans via Twitter. Table Read with Cast (1080p, 44 minutes, Disc 3) – This behind-the-scenes look reveals how Kurt Sutter and most of the cast and crew prepared themselves for the season finale episode "NS" by reading through the entire script. There are also occasional clips from the finished product that appear in a small picture-in-picture window. Directing the Finale with Kurt Sutter (1080p, 6 minutes, Disc 3) – This featurette focuses on Sutter and why he feels that it is important for him to direct the final episode of every season. The Future Begins Now (1080p, 10 minutes, Disc 3) – These are basically four short webisodes that bridge the gap between the third and fourth seasons. They include: "Pay Phone," "Tara and Piney," "Jax Meets Thomas," and "Mexican Basketball." Bike Customizer (1080p, 16 minutes) – Kurt Sutter partnered with the folks at Illusion Cycles to build a custom Sons of Anarchy motorcycle to auction off for charity (woundedwarriorproject.org). This featurette takes viewers through the entire build from start to finish. Deleted Scenes (SD, 28 minutes, All Discs) – Roughly ten minutes worth of deleted and extended scenes on disc one, fourteen minutes on disc two, and three minutes on disc three. As with prior seasons, there is lots of fun stuff here for fans including an utterly hilarious scene with Juice and Chibs. Gag Reel (1080p, 3 minutes, Disc 3) – The usual collection of blown lines and mishaps with plenty of "fucks" to go around. Glad they steered away from the cheesy blooper music montage from the first season. 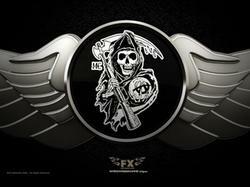 Fox Movie Channel Presents: Sons of Anarchy Season 3 World Premiere (SD, 5 minutes, Disc 3) – Fox Movie Channel correspondent Tava Smiley conducts a series of brief interviews with Hunnam, Perlman, and more on the red carpet for the season's premiere. Well, it seems Blue Öyster Cult was wrong. The reaper crew of Kurt Sutter's 'Sons of Anarchy' most certainly should be feared, and all the cowbells in the world won't be able to soothe the savage beast lurking within SAMCRO. 'Sons of Anarchy: Season Three' takes the show down a different road with even more bloodshed and betrayal, resulting in quite possibly the best season yet. 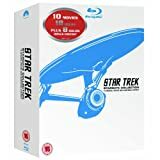 20th Century Fox revs up another quality release on Blu-ray packing praiseworthy audio and video, and the discs also contain a decent array of supplements that will surely please fans. So get your motor running and pick up this latest chapter to one of the most action-packed, well-acted, and addictive rides on television.